Harvest Pumpkin Watercolor Art Project. 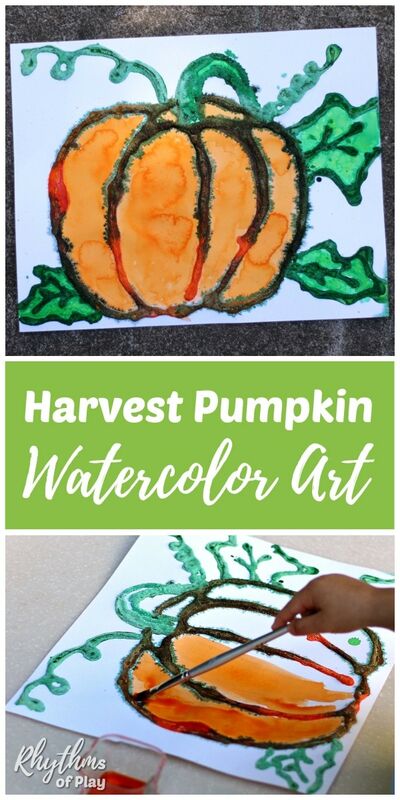 Creating harvest pumpkin art is an easy & engaging fall painting idea is perfect for both kids and adults. Everyone will enjoy the salt painting technique, used to create this raised, watercolor, decoration. Scroll down to learn how to make your own DIY autumn home decor! I’m in love with how this project turned out, but it is not how I imagined it at all… It turned out even better than I thought it would! 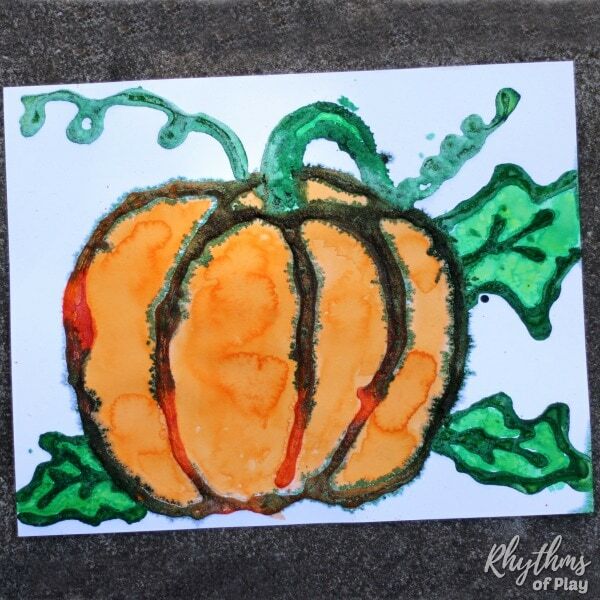 This pumpkin art started out as a simple pumpkin salt painting similar to the jack o’ lantern salt painting my daughter made. I knew the green would run into the orange a little, but since this was the first time that my daughter had ever tried salt painting with pipettes, she had a VERY heavy hand. She LOVED using the pipettes and watching the colors run but she was mad that the pumpkin wasn’t completely orange once she was finished. Did I mention that my daughter is totally and completely obsessed with pumpkins? She was instantly enamored with them when they first started showing up on doorsteps on our daily walks when she was an infant. She loves everything about them including going to the pumpkin patch. Well… apparently they MUST be orange. She threw a complete hissy fit when her pumpkin turned green! I told her that it made the pumpkin look more like a gourd, but that didn’t stop her complaining. 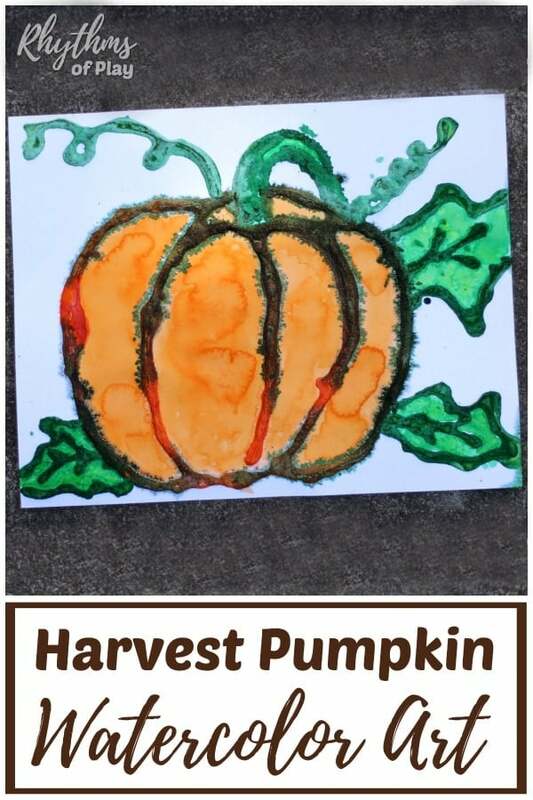 Take a look at how her harvest pumpkin art salt painting looked once it was dry. Then, all of a sudden, I had a fantastic idea. I placed a paint brush and watercolors in front of my daughter and invited her to paint her pumpkin art once again. This time I told her that she could paint with watercolors to fill in the outline of the pumpkin art. She was thrilled! I think it turned out absolutely gorgeous! What a beautiful Opps we created together! Beautiful Oops! is a kids book that shows young readers how every mistake is an opportunity to make something beautiful. This watercolor art project gave my daughter the opportunity to experience her own beautiful oops. It was lovely to witness my daughters’ initial anger turning into complete joy! 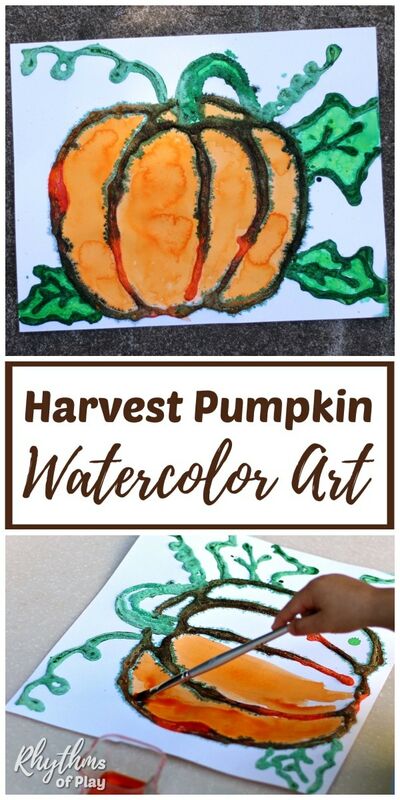 You can complete this fall harvest pumpkin watercolor art project with Stockmar watercolor paints or liquid watercolors with pipettes or you can use Stockmar watercolor paints or a solid watercolor pallet with a cup of water and a paintbrush. Both techniques provide fine motor practice and help develop hand-eye coordination. Younger children will need assistance with creating pumpkin art, while older children and adults can complete this project from start to finish on their own. You can do this for your child, or have them give it a go on their own. It doesn’t need to be perfect. You will be covering the lines with white glue next. Step 3 – Shake off the excess salt and use a pipette or brush to apply watercolor paint to the lines of salt and glue. Keep the different colored salt and glue lines separated if you do not want the colors to run. The fall harvest pumpkin art photo collage tutorial below shows what happens when the salt and glue lines touch. If you are using liquid watercolor you can use a pipette like my daughter is using in the photos above and below or a paint brush. If you are using a watercolor pallet you will need to apply the paint with a paint brush. Don’t forget that you will need a cup of water if you choose this option. Enjoy the transformation of your art as the green runs into the orange. Again, keep the different colored salt and glue lines separated if you do not want the colors to run. You can see the green beginning to bleeding into the orange lines as my daughter applies green in the photo tutorial below. Step 5 – Paint pumpkin with watercolors to fill out this beautiful fall harvest pumpkin art. Use a paintbrush and Stockmar watercolor paints, liquid watercolor paints, or a solid watercolor pallet to paint your fall harvest pumpkin once the salt paint is dry. Of course, my daughter picked orange and green to make her pumpkin orange again, but feel free to use whatever colors or combination of colors that you like! My daughter loves painting on our DIY outdoor art table and mud kitchen. Click on the link to learn how easy it is to make your own! 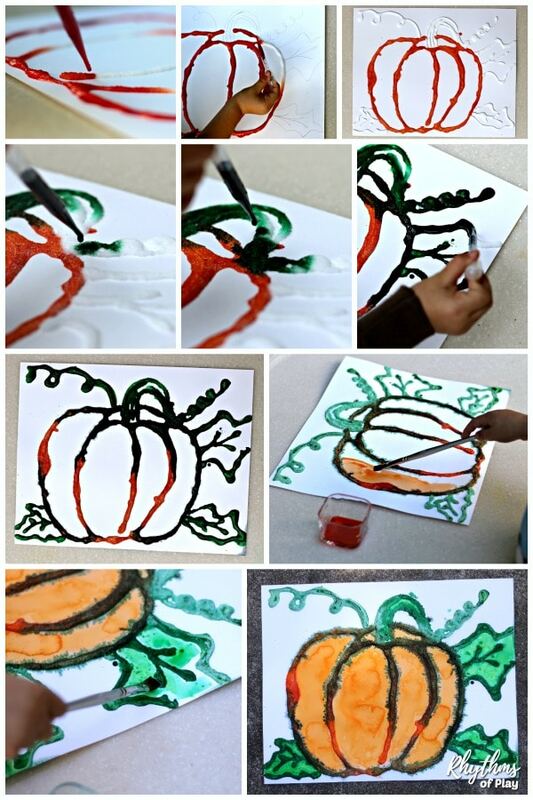 This harvest pumpkin watercolor art project is an easy painting idea for kids and adults. 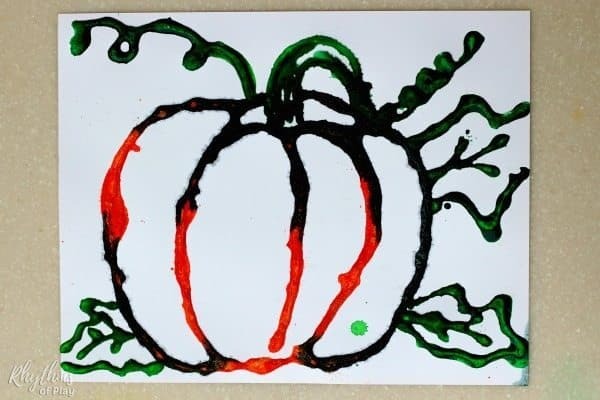 Kids from preschool age and up will enjoy the salt painting technique used to create this raised watercolor fall decoration. You may also like this gorgeous collection of fall nature crafts (contains pumpkin carving and decorating ideas) and this collection of the best fall art projects for kids.